Camaflexi’s Santa Fe Bunk Beds are top quality! Camaflexi is a family-oriented company, built with safety and flexibility in mind. Possessing an aesthetically pleasing design, Santa Fe Bunk Beds will add a natural sparkle, style and overall-beauty to any bedroom or specified room. With many colors to choose from, white, natural, cappuccino, and chestnut; and designed in the open mission headboard style that will definitely enhance your room. Add the modesty panel to your bed, if you'd like, or go without it. With the additional options including the under bed storage drawers or the trundle bed for maximized space and room organization, Planet Bunk Bed and Camaflexi have you covered! 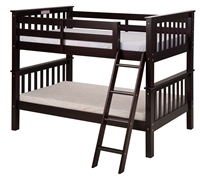 Planet Bunk Bed is excited to offer you Santa Fe Bunk Beds, which are both so elegant and so tasteful. Camaflexi’s Santa Fe Bunk Beds are built with the strongest material, 100% Solid Pine Wood, which is durable, flexible, and beautiful! With our customers’ safety in mind, the Santa Fe Bunk Beds meet and exceed all government and industry safety standards. Planet Bunk Bed offers free shipping on all orders above $249.99 and an easy 30-day return policy, so you can order your favorite Santa Fe bunk bed both quickly and worry-free.